I was tickled to see a mention about fruit spoons in the April edition of House Beautiful. They showed some gorgeous reproductions being made and sold here. 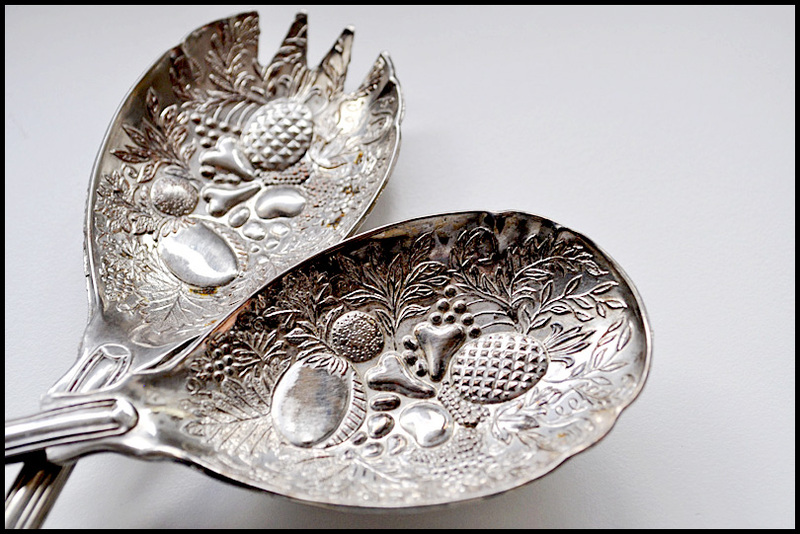 The reason I was tickled is because I have some lovely authentic vintage berry spoons in my shop right now for a fraction of the cost. This one is from England and has an "S" monogram on the handle, a steal at only $12. Can you see my dilemma? I was thinking about cleaning some and leaving some unpolished in all their shabby chic glory. What do you think? Do you prefer it already polished up or with the original patina left on? I love the term flatware - it's one of the many little tidbits of language shift that I've picked up since blogging. Cutlery is the only way I've ever known how to refer to knives, spoons and forks - flatware sounds so cool. As for the tarnish/no tarnish dilemma - I like your idea of offering a tableau - some with, some without. Perhaps your customers could have a little button to click or a comment section to advice if they want the decades of oxidisation left on. Happy day - I'm off to play the spoons! I use the baking soda method and it works perfectly! I love your berry spoons! I kind of like it tarnished. I like your idea of offering both. Then you can see what you sell more of. If you sell more unpolished - yay you! Less work! Also, if you sell it unpolished, your customers have the option to leave as is or to polish it themselves. I would imagine people who buy vintage are used to doing this. I like the shine! But I would not be excited to do all of that. You know me, shine every time but thank goodness for different tastes. Perhaps there are people who would prefer to have pieces with the tarnish. You are such a trend setter ! I like the tarnish look but if you use them they have to be cleaned. @bronwyn has a great idea. Maybe you could leave them tarnished, show a spoon that is cleaned in your listing and offer your Baking Soda recipe and or offer to clean them before mailing ? Could save you the time of cleaning all the pieces. I'm with MJM. I like the shine, but it is a bunch of work. Oh gorgeous. Look at the detailing! I like them polished, it seems to do more justice to the detailing. I prefer it shined up but I've some old tarnished pieces in my shop and they get snapped up quickly! Ohhhhh! it has an S on it - sooo tempting!